It’s already been one month mum at house and she cook for our meals. I have a problem with mum cooks. It is because they are toooo saaaaltyyyy and sweeeeeet. =) I don't mind the test, but it's really bother me she didn't care about healthy salt and sugar consumption. I continue my advice explaining to her about the science behind it, how unhealthy diet cause disease, the worst that might happen, how sickening it is, how money is wasted by us being ignorance and at one point I’m just upset and angry. Today I eat lunch when everything is toooooo salty. It didn’t taste like meat anymore, but salt. And I can’t eat the sauce because of toooo much salt. I dint exaggerate when I say I feel my esophagus like inflamed. Again we talk about salt, that too much can cause kidney problem and once the 2 kidneys cannot function we have to rely on dialysis. Being ignorance is the thing that can lead to misery in the future. How we should care and be grateful for the bliss of good health. I want to care for my family but end up I get more stress when it didn't work. Yet I didn't have a heart ignoring the bad habit knowing I will be the one that most sad if anything bad occur. Luckily other than problem with sugar and salt consumption, mum live a healthy lifestyle. She have good body, she didn’t like oily food, she love gardening and doing physical work, she did ibadah and she eat more vegetable and fruit. Her overall health check results also normal. Alhaamdulillah... I really hope mum can always be healthy and happy because she is the best mum for me that I love so much. These are the things that upset me. I’m worried about her health, but she seems so stubborn. I share this story with my best friend when she advice me try to talk nicely to mum and pray that she will change her bad sugar/salt consumption and always being healthy. She tells me to not advising in rude manner as we ourselves might not know our own attitude in the future. These words really make think deeply and calm. I’m not sure if it is the cause, but I think mum has lost her sense of test because she always gargle vinegar to treat ulcer/gingivitis problem in her mouth. It’s already being more than 10 years she doing that with frequency twice a week. When I was about 15 years old, as someone that know very little, I bought a commercial mouthwash for mum. She uses it but maybe she didn't feel it helps, after it finish she dint repurchase and again depend on vinegar to treat her ulcer. I advice her to check at clinic but she refuse saying she afraid of the Dr and she was not in pain, even though she is. After that we were apart because I went into collage, university and then working. I didn't give much attention regarding her ulcer problem because every time I ask, she said it improving and it didn’t hurt. If I ask her to meet Dr for a check up, she will just ignore or cut the conversation/line. However I feel grateful because since 2 years ago mum use commercial mouthwash to treat her gingivitis problem. I bought 2x500ml mouthwash without discussion (as she tends to refuse things) and ask her to try it. Alhamdulillah she gets positive improvement and she think the mouthwash does help the gingivitis problem. She didn’t use vinegar anymore and her gum bleeds less. I am glad but still worried if anything leads to worse situation. May Allah grant my mum with good health. Amin..
As a conclusion, don’t use synthetic vinegar to treat your ulcer as it may kill your test buds if done repeatedly. Be grateful to your health, take care of it and love your family. If you got sick, your family will hurt as much. O Allah, Thank you for blessing us with Islam and good health and may we grateful with it and use it for good. 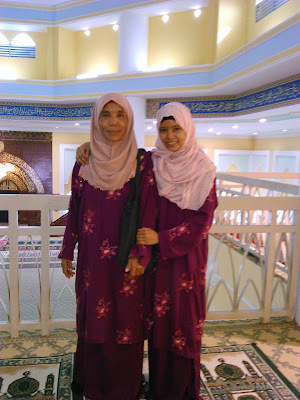 Mum is someone that very diligent in doing ibadah (100X better than me as I very much just doing basic), I hope if she can have a good health, care herself and happy. Amin..